A fun way to learn the history, and master the techniques of Cuban music. The signature sound of Cuban music is popular throughout the world. At its heart is the clave-the underlying groove that defines the music of Cuba. In Guitar Atlas: Cuba, author Jeff Peretz breaks down this fundamental rhythm and shows that the clave can be played by any guitarist. For those who do not play Cuban music, the concepts in this book improve sense of rhythm and syncopation in any style. 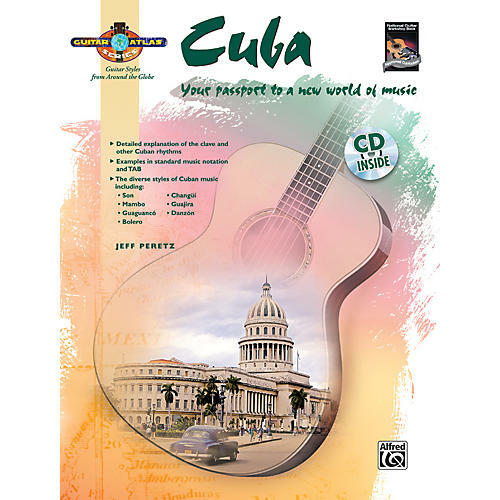 In addition to teaching the music itself, Guitar Atlas: Cuba also explores the background of Cuban music, including African and European cultural influences, as well as the impact of the political events of the 20th century. You'll learn about the different styles of music from all over the island, the musicians who popularized them, and explore the unique instruments of Cuba. A CD with demonstrations of all examples and compositions is included. Discover the paradise of this island nation's most popular music. Order today.